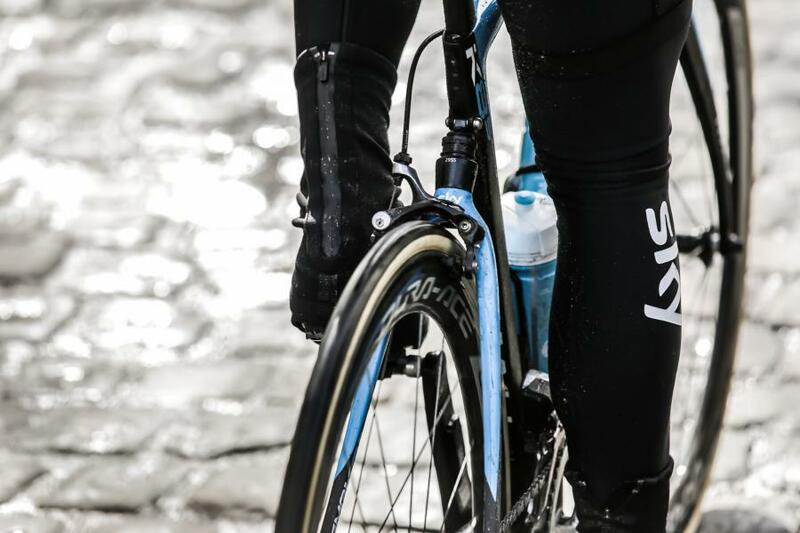 “Game changing.” That’s the verdict of Sir Bradley Wiggins on a new bike developed by Jaguar in partnership with Pinarello and Team Sky that he hopes will carry him to victory a week on Sunday over the cobbles of Paris-Roubaix, his final race for the British WorldTour outfit. Unveiled today, the Pinarello Dogma KS-8 is claimed to bolster performance over rough terrain by 4.6 per cent, and to improve rider comfort by as much as 50 per cent. If those figures are true, it’s not so much a marginal gain ahead of two of cycling’s toughest races, but potentially a huge one, should the claim prove true on the road. The bike's unveiling comes during what is already turning out to be a very sucessful Classics campiagn for Sky, with Ian Stannard winning the Omloop Het Nieuwsblad for the second year running, and Geraint Thomas, pictured below, taking victory in the E3 Harelbeke and a podium place at Gent-Wevelgem last Sunday, where he finished third. The launch of the bike, which will make its competitive debut at Sunday’s Tour of Flanders, is accompanied by an unsurprisingly gushing press release. But is it really as innovative as Sky, Pinarello and Jaguar claim? Before we give our take, here’s what Sky and its sponsors have to say about it. It’s said to “create a pioneering suspension pivot in the rear triangle to ensure perfect riding comfort over rough terrains,” as well as cutting the fatigue of riders, as well as insulating them from bumpy road surfaces. That last point should be particularly appreciated by Wiggins, who has sensitive hands, and rode with three or four layers of bartape at Paris-Roubaix in 2011. He said of the bike: “From the moment you get on it, you realise the difference straight away, especially on the cobbles. 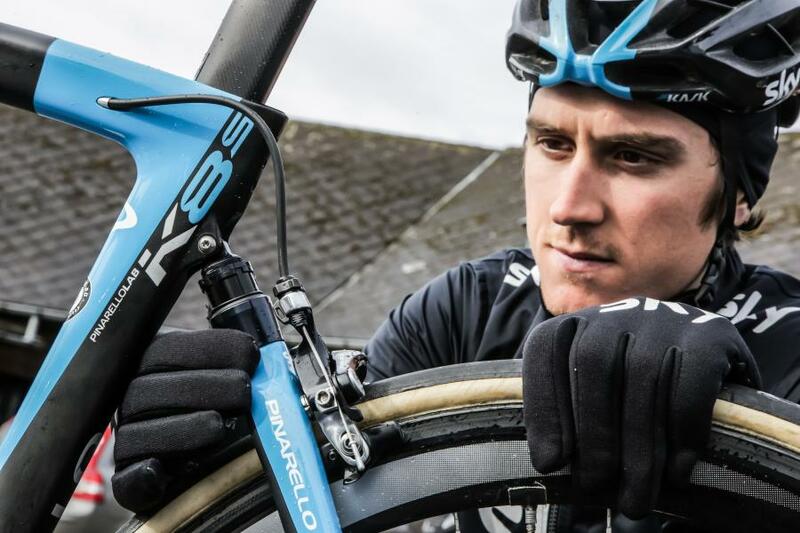 “I’ve never ridden anything like it on cobbles before, which is the most extreme terrain you can ride a bike on. The way it feels, its aerodynamics, stiffness, and improved flex in the rear, is game-changing for cycling. “This is the first time anyone has gone out there, looked at the demands of the cobbles, and made a bike specifically for that job. It was really noticeable in testing between the guys on the K8-S to the others that weren’t." Wiggins, plus team mates including Geraint Thomas and Ian Stannard, will ride the bike on Sunday, and he added: “It gives us lots of confidence and a huge advantage on the cobbles. He said: “We’ve been able to knit together Pinarello's world class knowledge in bike design and Jaguar's industry-leading technological and engineering expertise, with a proven winning team of riders and experts in human performance, to come up with something truly ground-breaking. Brailsford added: “The Classics have been a big goal for us this season and with Ian Stannard’s win at Omloop Het Nieuwsblad and Geraint’s win at E3 we’ve had a great start. That’s the PR angle, but here’s our take, from road.cc tech editor, David Arthur. Pinarello and Team Sky are using phrases like “game-changing” and “pioneering” for the new Dogma K8-S road bike, but is it all that? The design is essentially a soft tail, a design of bicycle that relies on flex in the chain stays to provide vertical rear wheel travel, with a small damper located at the top of the seat stays. Trek most famously developed a prototype bike that George Hincapie used in the 2005 Paris-Roubaix, and again in 2006 – when the steerer tube snapped, ending his race. The system offered about 12mm of travel, not much, but enough to reduce the vibrations from riding over cobbles. There were no pivots, just enough flex in the carbon fibre rear stays. Trek quietly phased that bicycle out before it was even made available for public consumption. 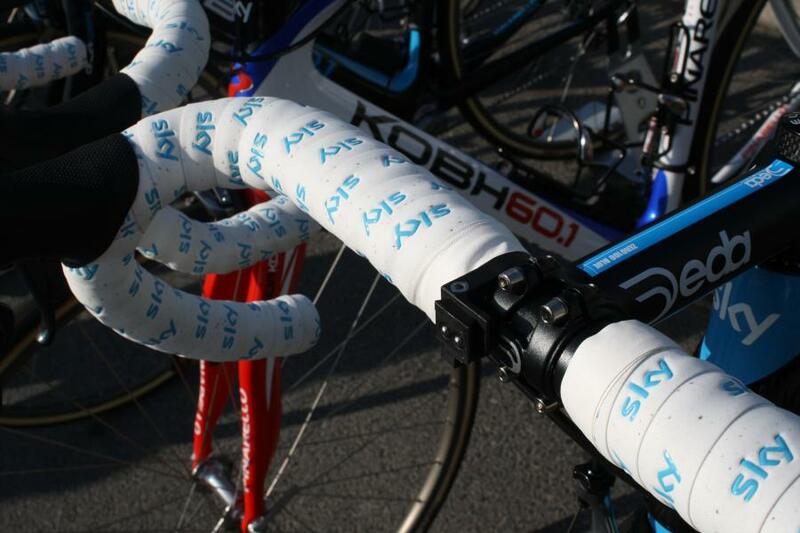 A similar system was available in the Trek Pilot road bike, but used a different geometry to the race bike. On the mountain bike side the Trek STP was popular, at a time when mountain bike suspension was in its infancy. Such bikes are still available, you can buy a Moots titanium road bike with a YBB soft tail option, which comprises a damper housed at the stop of the wishbone seat stays and, instead of pivots at the bottom bracket, relies on flex in the titanium chain stays to offer a small amount of rear wheel travel. So the Pinarello Dogma K8-S takes an existing design and the critical thing will be how, and if, they have managed to make improvements in its application on a modern and lightweight road bike. Most bike brands have been busy developing 'endurance' bikes designed to tame rough roads, from the extreme (Trek Domane, Specialized Roubaix) and the subtle (Cannondale Synapse, Bianchi Infinito, Giant Defy), but the new Pinarello is a step above those designs in actually employing suspension components, not just relying on flex or moving parts.